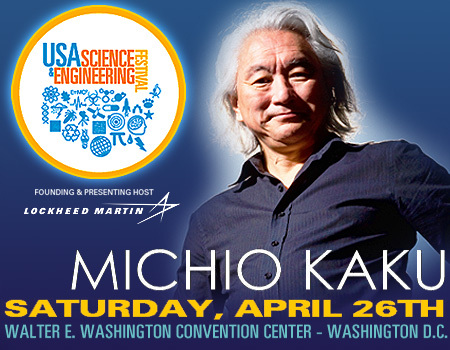 Dr. Michio Kaku is a proud participant in the upcoming 3RD ANNUAL USA SCIENCE & ENGINEERING FESTIVAL taking place on April 26th and 27th, 2014 at the Walter E. Washington Convention Center in Washington, DC. The FREE festival is analogous to an art, music, or food festival, but with a focus on science and engineering. There will be over 3,000 hands-on activities and over 150 stage shows. The event is also a resource for information about scholarships, internships, jobs, and taking part in science’s new frontiers. 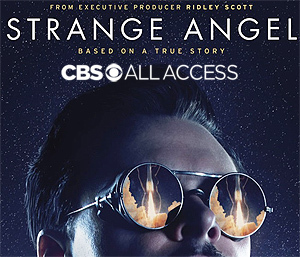 "As a culture, we celebrate actors, pop stars and athletes… and we generate a lot of them. Our mission here is to celebrate science and engineering by producing and presenting the most compelling, exciting, educational, and entertaining science festival in the United States," said Larry Bock, USASEF Founder. Dr. Kaku will speak to a live audience on the EINSTEIN STAGE at 4 PM on Saturday, April 26th, 2014. Following the speaking event, at 5 PM, Dr. Kaku will meet and greet fans at an official booksigning at TABLE #4 of the festival’s on-site book fair. Dr. Kaku will be signing copies of his latest New York Times Bestseller, THE FUTURE OF THE MIND. Want more? Watch this awareness video for the festival and this preview video about Dr. Kaku’s appearance. 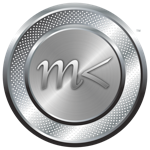 For more event details, simply click here. 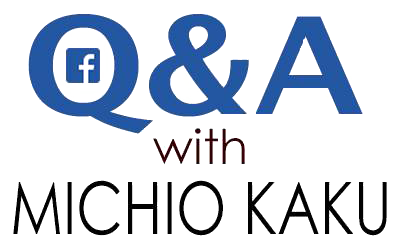 Join us on Monday, April 7, 2014 at 8PM EST (5PM PST) for a live Q&A with Dr. Michio Kaku at Apple’s iTunes Facebook page. You will also find related links on Dr. Kaku’s Facebook page. He will be answering questions about his new book, THE FUTURE OF THE MIND. A New York Times Bestseller, taking the #1 spot in March, the book is now available as a digital download in audiobook format at Apple iTunes and as an ebook at Apple iBooks. 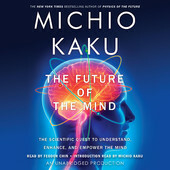 The audiobook edition of THE FUTURE OF THE MIND is completely unabridged and features audio of the entire introduction read by Dr. Kaku himself followed by the narration of award-winning voice artist, Feodor Chin, a veteran of Michio Kaku audiobooks. Don’t miss this opportunity to chat online live with Dr. Kaku directly!